The original plan was simple. 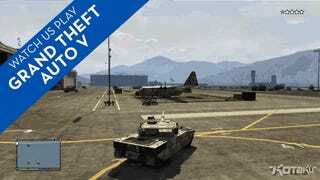 Drive to the airfield and take the plane Trevor uses to run drugs and show off flying in GTAV. Unfortunately, I forgot that I had landed that plane in the middle of the highway and abandoned it. Plan B: Go to the airport and steal a private jet. What could go wrong? Along the way, Kotaku Editor-in-Chief and GTA V reviewer (check it out here) Stephen Totilo and I explain some of the new features in the game, like the weapon wheel, barber shops, psychiatrist visits, and of course — who comes after you when you start throwing grenades into crowded intersections. Somehow we ended up in a tank, blowing up military aircraft, so I guess it all worked out. Grand Theft Auto V comes out tomorrow, September 17th, on Xbox 360 and Playstation 3.